The current Dalai Lama is Tenzin Gyatso, who has been one of the most influential political leaders in the history of the Tibetan people. At the age of 15 he was named the Tibetan Head of state, only one month after the Peoples Republic of China invaded Tibet. In 1954 the Dalai Lama went to speak to Mao Zedong on behalf of the Tibetan people, and later left Tibet to go to India to help establish the Central Tibetan Administration. Gyatso was the first Dalai Lama to travel to the West, and helped to promote the concepts of universal responsibility, secular ethics, and religious harmony across the world in accordance to Tibetan Buddhist teachings. In 1989 he was awarded the Nobel Peace Prize, which is awarded ” “to the person who shall have done the most or the best work for fraternity between the nations, for the abolition or reduction of standing armies and for the holding and promotion of peace congresses.” Throughout his tenure as the leader of Tibetan Buddhism, the current Dalai Lama has written 18 books, and has been an outspoken advocate of peace and tolerance and of improved relations between the religions of the world. 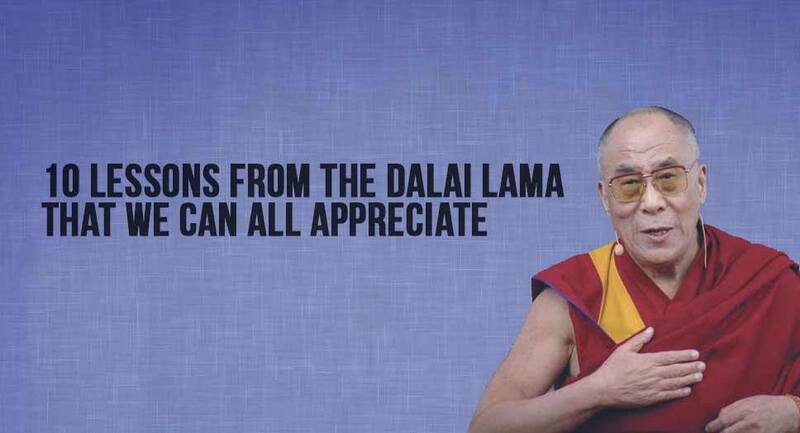 Here are 10 Lessons that the current Dalai Lama has taught through the years, that apply to all of us, and serve as a great reminder of how we should treat each other, and ourselves.